OTTAWA, CANADA - Eurocom Corporation has released a new mega-wide notebook with a spectacular 17-inch widescreen display, internal built-in sub-woofer with surrond sound and/or TV Tuner for complete portable home theather experience. Powered by high performance fully upgradeable Intel® Pentium® 4 processor up to 3.06 GHz with Hyper-Treading Technology and superb graphics performance engine based on ATI Mobility Radeon 9000 with 64 MB of DDR video, the new EUROCOM D470W notebook is a perfect computing solution for widescreen applications or as a portable personal home theather system. The EUROCOM D470W Impressa model features a 17-inch WXGA wide screen with 1440-by-900 resolution and 16:9 aspect ratio, the largest display ever to grace a notebook. This superb display offers the same viewing area as a 19-inch CRT monitor providing plenty of room on a desktop for menus, toolbars and palettes as well as a great DVD movie watching experience. The high-end ATI Mobility Radeon 9000 graphics engine with 64 MB of video memory and a sub-woofer surround sound with four speakers will satisfy the most demanding users of power hungry graphics applications, 3D video games and DVD movie playing. The VGA system features AGP 8x, 2D/3D graphics engine and fully Direct 8.1 multi disply capability. The S/PDIF port provides AC3 sound effect of a home theatre while the S-Video Out port offers crystal clear video picture to higher end TV sets for a luxurious cinema-like experience. A great looking case, in brushed silver and dark charcoal merely hints at the power and and flexibility that lies within this magnificent notebook. Designed for all-day computing, anywhere, anytime, the D470W Impressa is a mobile powerhouse supporting Intel® Pentium® 4 processors up to 3.06 GHz with Hyper-Threading technology, memory up to 1 GB DDR266/DDR333 SODIMM easily upgradeable via two sockets, and up to 60 GB 5,400rpm easy-to-change hard drive as well as Wireless LAN 802.11b Wi-Fi, and an optional DVD Burner (DVD-R/-RW). In addition to full configuration and upgrade ability, the D470W model features a full size 102-key desktop-like keyboard with a separate non-embedded numeric keypad making typing and numer crunching easy and very comfortable. The full size 25-inch long 102-key keyboard is the same keyboard as the one featured in the EUROCOM 8500V and 888SE notebook models. The D470W Impressa based on the SIS645DX+SIS962 chipset and Intel® Pentium® 4 processor up to 3.06 GHz with Hyper-Threading technology delivers cutting-edge system performance for use in home computing, business solutions and all your processing needs. The Intel® Pentium® 4 Processor with Hyper-Threading technology allows software programs to "see" two processors and work more efficiently, which improves performance and system responsiveness in today's multitasking environments by enabling the processor to execute instruction threads in parallel. The D470W Impressa weighing 3.4 kg is easy to take anywhere, whether you want to browse the web from the chaise lounge in the backyard, a coffee shop downtown or an airport terminal. An integrated Wi-Fi/802.11b (11 Mbps) or 802.11g (54 Mbps) Wireless LAN and Bluetooth in addition to built-in 10/100 LAN and 56K V90/V92 WinModem make this notebook an ideal travel companion to keep you connected wherever you go. The EUROCOM D470W notebook, in addition to fast processing power and wireless capability, features an integrated CCD video camera that can capture digital still images as well as video clips complete with sound providing a complete high performance video and graphics solution for professional users. Advanced audio and video performance is guaranteed on the D470W notebook designed for the ultimate home entertainment. Compatible Sound-Blaster PRO, 3D Stereo enhanced sound system, sub woofer, four built-in speakers, S/PDIF digital output (5.1CH) will transform this notebook into a thundering home cinema providing all the thrills of surround sound audio, whether it is enhancing the sound effects in your favourite movie, blasting out the latest games or immersing you in music. In addition to an internal 3.5" 1.44 MB floppy drive, the D470W notebook offers a choice of optical drive: CD-ROM, DVD-ROM, CD-RW, COMBO (DVD-ROM/CD-RW) or DVD-Burner (DVD-R/-RW). The DVD-R/-RW option allows users to take advantage of increased entertainment and productivity capabilities including home movie editing and the ability to store large amounts of data such as multimedia presentations, digital images and audio files in DVD format. Users can also play DVD movies and CDs and save them in CD, DVD or MP3 audio formats faster than ever before. 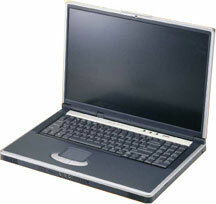 An optional cable-ready internal TV tuner allows users to watch TV in a resizable window, right on the large 17-inch LCD notebook screen as well as record incoming video from a TV, a camcorder or DVD-ROM to the CD and DVD Burner through the auxiliary audio/video input (S-Video port). With a CD-RW or DVD-R/-RW drive you can save personal home videos or memorable TV clips to MPEG I/II format to store on CDs and in DVD format to store on DVDs and simply mail the disks or email the clips to your friends and relatives. With this cost-saving feature, you will be using CDs and DVDs instead of VHS tapes in no time. Videoconference over the Internet, snapping still video images in JPEG, TIFF or BMP, making video movies in AVI file format and burning DVDs becomes a breeze on the D470W Impressa notebook. One can also listen to FM radio or watch TV in a resizable window while simultaneously working on different applications or surfing the net. The Fully Functional Infrared Remote Control gives the flexibility to change channels, adjust the volume or turn the radio on from a distance. The internal TV tuner is available for different TV systems, such as: NTSC (for Canada/USA, Japan), PAL N and PAL M (for Europe, Australia, China, Middle East). The EUROCOM D400W Impressa comes with all standard ports such as: 1x type II CardBus PCMCIA, 1x IEEE1394/FireWire, 1x Serial; 1x LPT1/ Parallel; 1x IrDA; 1x CRT; 1x PS/2; 1x headphone; 1x mic-in; 1x SPDIF for AC3; 1x RJ11 for modem; 1x RJ45 for LAN as well as 1x S-video TV out port and four USB 2.0/1.1 ports, carrying bag, auto-switching AC Adapter and Smart Li-Ion battery. The new the EUROCOM D470W Impressa incorporates the full functionality of a desktop replacement notebook in an elegant, slim and lightweight package. Equipped with a variety of features, beautiful wide screen, integrated wireless connectivity and built-in video camera, the D470S model delivers a complete mobile cinema computing experience to a most demanding user. The retail price starts at $2899 CAD.